AJAX powered CodeTranslator: Free Code Translation From VB.NET <-> C# by Carlos Ag. Via Darrell. Very cool - if you're a geek. you might not expect that _day would have a value at this point. Unfortunately you’d be wrong - _day would equal Days.Sat. The default value of an enum E is (E)0, which in this case is the first Days value, Sat. Now, surely _day would have no value? Nope – enums are value types, integers to be exact, and their default value is always 0. So in this case _day would simply equal 0. Additionally, if someone attempted to set the value of _day to 8, you might think this would cause an error. Again you’d be wrong. The value of _day would simply be 8.
http://rds.yahoo.com/S=1933683/K=computer/v=3/SID=y/l=WS1/R=1/SS=49221344/IPC=us/SHE=0/H=0/SIG=91234gwS08/EXP=564103787/*-http://google.com.mtg****.net/home.asp (I have ****'ed out the final domain name to avoid giving them any additional advertising). Yahoo actually allows this without any questions. Try http://rds.yahoo.com/*-http://google.com for example. Or http://rds.yahoo.com/*-http://msn.com. As best I can tell, Yahoo uses this service to redirect (and track) clicks on ads, etc. They have another service that does the same: http://rd.yahoo.com, but at least it's smart enough to check the final destination: http://rd.yahoo.com/*-http://google.com (or maybe it just uses a different scheme). The Electronic Frontier Foundation fights a number of important battles against special interests on behalf of the public. Through their Action Center you can send e-mails and faxes to elected representatives, voicing your concern over, or support for, an issue. Huh? 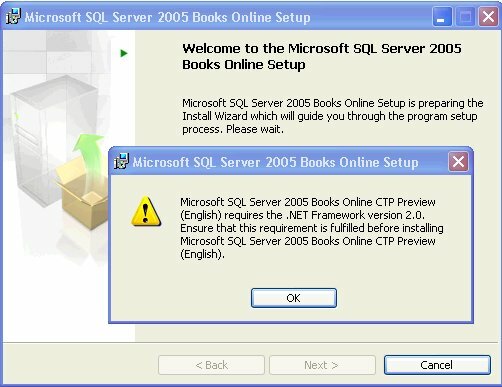 Why does Books Online require .NET at all? Did they change the Help format?